In a survey conducted by the American Academy of Cosmetic Dentistry, when asked what they would like to improve most about their smile, the majority of survey participants said that they wanted a whiter and brighter smile. Your smile can be brilliantly whiter in an hour, with Zoom!® Whitening from cosmetic dentist and accreditation candidate Dr. Duane Delaune. This procedure is an in-office treatment that whitens your teeth up to eight shades lighter in an hour. The initial treatment is done in our office, and you will follow up at home with a kit that includes comfortably fitting trays for your teeth and whitening gel. We generally start by cleaning your teeth before you receive the whitening treatment. Your lips and gums will be covered so that only your teeth are exposed. The whitening gel will be applied to your teeth. 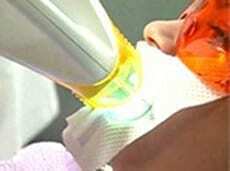 A light will be used to shine on your teeth and activate the gel, which contains hydrogen peroxide. The gel will gently penetrate your teeth and break up discolorations and stains. You will have brilliantly whiter teeth in an hour. You will receive take-home whitening gel and trays that will comfortably fit your teeth. For 14 consecutive nights, you will put the gel in the trays. Then, you will place the trays on your teeth to further whiten them overnight. At the end of your take-home treatment, your smile will be dramatically whiter! Follow the instructions that you will receive from Dr. Delaune for occasional touch-ups at home to maintain your brilliant smile. Dr. Delaune is an accreditation candidate with the American Academy of Cosmetic Dentistry. He will be able to determine if whitening with Zoom is the best treatment for your teeth, and he can anticipate any sensitivity issues that you might experience with the treatment.